Launched in 2002, the World Poker Tour (WPT) is an annual international series of poker tournaments. Steven Lipscomb, an attorney and television producer, created the series in the United States to build on the annual excitement of the World Series of Poker (WSOP). In fact, there are a many similarities between the WPT and WSOP. The WPT and WSOP event and satellite structure are quite similar. In addition, like the WSOP, the WPT receives a great deal of media attention, broadcasts its final tables all over the world, and awards bracelets to its winners. In 2009, PartyGaming acquired the WPT from WPT Enterprises (WPTE) for more than $12 million. In 2011, PartyGaming merged with bwin to become bwin.Party Digital Entertainment, a formidable online gambling presence. In addition to televising the Main Event final table, the WPT has a year-round television program. The program generally coincides with the WSOP's television schedule, and the announcers are Mike Sexton and Vince Van Patten. Recently, the WPT added a second television series, this one sponsored by PartyPoker. The PartyPoker TV series is a Eurocentric show that focuses solely on the WPT's European stops. The announcers are Mike Sexton and Jesse May. In the US, WPT television partners include NBC, Fox Sports Net, Game Show Network and the Travel Channel. 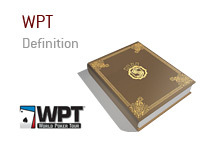 A big part of the WPT's recent success is ClubWPT, which WPTE launched in 2008. ClubWPT is a subscription-based online poker room that caters to US players and overcomes the UIGEA by exploiting the sweepstakes laws. ClubWPT also acts as a WPT qualifier, and it allows US players to win seats to WPT qualifiers and events all over the world. Players outside the US can win seats online through qualifiers at PartyPoker and other promotions. WPT Ladies was a short-lived women-only series of tournaments in 2008, won by Nancy Todd. The WPT champion is the person who wins the WPT Word Championship, which is the Texas Hold 'em Main Event. The WPT also honors "Player of the Year," which is the person who achieved the most success for the entire year.